If you are a fan or owner of the Audi RS6, you probably have heard of the Sportec RS600. Sportec took the stock RS6, added bigger turbos, and a few other unique modifications. One of the biggest problems with the 4.2L turbo engine in the RS6 is that it gets very hot. Since heat is a performance and economy killer, getting rid of that heat is a good thing. 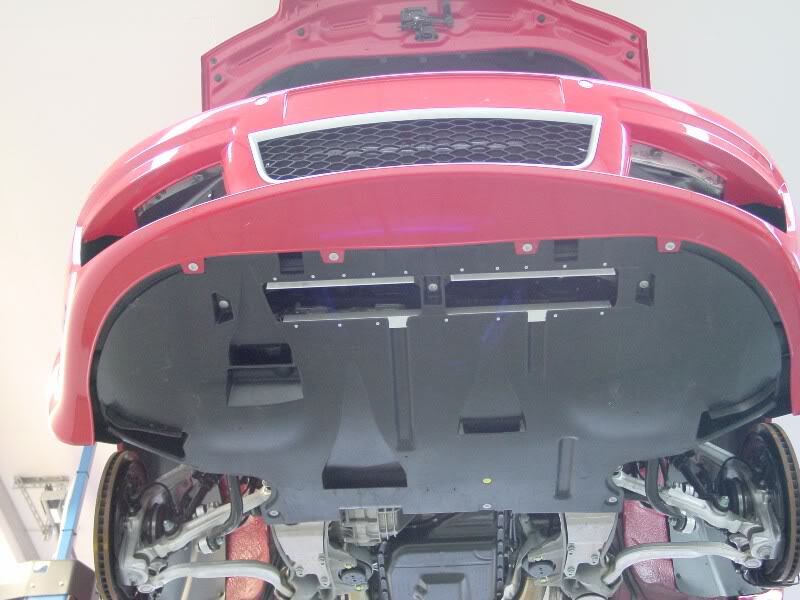 Sportec came up with a solution to the heat problem that is easy to copy and apply to your car. One of the modifications to the RS600 was a vent on the engine's undertray. It was used to extract hot air from the front of the engine and give air coming through the radiators a place to exit. This was not just any old hole as the engineers came up with a good solution. You can see that the vents are large rectangular cut outs directly below the front of the engine. You also probably notice that there looks to be aluminum strips coming down from the front of the vent holes. Those are technically known as Gurney Flap and was named after motorsports legend, Dan Gurney. The strips of aluminum are facing down and a negative pressure area is created behind them as air rushes past. That negative pressure area causes the air to be pulled out from the engine compartment, and thus lowers ambient temperatures near the engine. This modification is pretty easy to do and one of those nearly-free modifications that will make your engine smile. First, roll the car up on some blocks of wood to give yourself a bit more room under the car. If you have a car lift, well, I'm jealous! Take off the undertray and if you feel motivated I would recommend power washing the plastic. Use blue paint edging tape to mark out where you are going to cut. If you click the image below, you will be able to estimate where I am going to cut. There are enough indentations to create reference points for your project. Take a large drill bit and drill holes in each inside corner of the soon-to-be vents. The holes are going to be used to the cutting process. I used an electric jig saw to cut out the vent holes, but you can use whatever other method you choose. I also used an electric sander to clean and smooth up the edges. You will also need to cut slots up 1" (the width of the aluminum strips used below) where the two bumps are in the plastic. This is so that the aluminum strips can lay flat across the vent. Cut 1"x1" 90 degree aluminum strips the length of the vents on the top and bottom. You can buy these from most home improvement stores and they are pretty inexpensive. Also, make sure you pick up 3/16" stainless steel rivets and washers. I don't recommend aluminum rivets, because they don't pull tight enough before breaking off. Drill rivet holes in the aluminum every few inches and then transpose those holes to the plastic undertray. Make sure you label each aluminum strip so you remember exactly where they go and what direction. 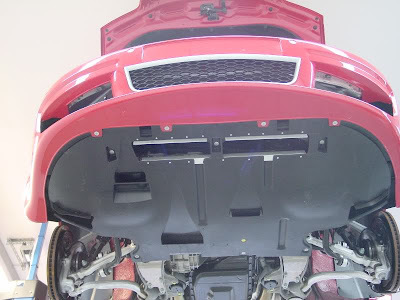 You will also need to purchase aluminum grill mesh that will be used to keep rocks and other debris from coming up into the engine compartment. Pep-boys and other similar stores usually carry these grills. Cut out the aluminum mesh so that it can be sandwiched between the plastic and aluminum strips. You will probably want to take a hammer and flatten out the mesh grill on the edges so you have a tighter fit. Congratulations, you've performed a pretty simple and cheap modification that will minimize the amount of heat soak from this Cosworth-built engine!